There is a lot of things that people don't know about greyhounds. Here is some basic information that might surprise you! Q - Aren't greyhounds "hyper"? A - Quite the opposite. We have been breed for millennia to give a quick burst of blinding speed, and really have very little stamina and don't need much activity to be happy. Think of the fast cat, the Cheetah. The cheetah can run for only a short distance at 60mph, and spends the rest of the day lounging around. It's the same with us, only we tend to lounge around whether they get any exercise that day or not! That's why we are nicknamed "45 M.P.H. Couch Potatoes". Q - Do I need a huge fenced yard? They must need a lot of exercise. A - A fenced yard is ideal, of course, mainly as a convenience for the owner who otherwise has to walk the dog 4 or 5 times a day. But it is not absolutely necessary if you are committed to walking us and understand that We can not, under any circumstances, be let off leash unless in a securely fenced area. As for exercise requirements, many Greyhounds would be happy if their only exertion was to go from the couch to the food dish, but daily walks and the occasional run in a fenced field are recommended for their health. We all love to run when given the opportunity. Q - Aren't they tortured and mistreated at the track? A - The majority of tracks take adequate care of their Greyhounds (otherwise they couldn't run and make money!). Although the dogs don't live the pampered life of house pets, they are sheltered and fed. All states that allow racing classify Greyhounds as livestock, and they are treated as such. There are concerns about the lack of treatment for parasites and injuries, and there are isolated reports of abuse, but things are getting better. However, unwanted Greyhounds are still routinely killed, sold for medical research, or meet other fates that are simply a waste of these beautiful animals. Q - Aren't they "wild" when they come off the track? A - Absolutely not. The trainers are sure to handle and socialize the dogs from a very early age - it makes them easier to deal with on a day to day basis. We are very attached to our people and will happily accept as much attention and affection as we can get. The term "Velcro Dog" is often applied to us when we are fresh from the track. We never want to let you out of our sight! Q - Why are they so skinny? Will they ever fatten up and look "normal"? A - Once again, those 8,000 years of breeding come into it. We are made for two things - hunting and running very, very fast. Therefore we have excellent eyesight and a body that has eliminated all attributes not condusive to speed. One of the unnecessary attributes is fat. Greyhounds have hardly any body fat, and that's the way they are meant to be. At their ideal weight, the back 3 ribs should still be visible, and a slight protrusion of the hipbones is evident, though the spine should not appear as a boney ridge. The sleek, streamlined shape and defined muscles of a healthy Greyhound are evidence of his/her highly specialized nature and should be admired! Q - How old are the retired racers? 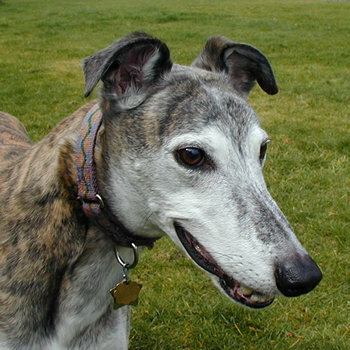 Q - Are there any health problems specific to ex-racers that I should be concerned about? A - Racing Greyhounds are a very healthy breed. Genetic problems such as hip dysplasia are almost unheard of, because a racer who is physically inferior simply won't be bred. Only the best of the best are allowed to produce puppies! The most common health issues particular to racing Greyhounds: Tick-borne diseases and worms from living in unsanitary, parasite ridden conditions (all are curable with proper medication). Some of the racers that had longer careers may suffer from arthritis or tendonitis in their later years, and the diet of raw meat that the dogs are fed during their racing life can result in teeth that are old before their time. Also, Greyhounds have very delicate skin and tend to "tear" more easily from sharp objects than most dogs.